Starting in June 2017, we will stop releasing major numbered versions. For you, this means an uninterrupted flow of new features and content. For us, this means a drive to push forward and deliver all year long. Welcome to Substance! Since you have purchased a Substance Painter 2 license, you will get free updates until September 30, 2017. After this date, you can purchase 12 months of updates for the price of $75 at any time or subscribe to Substance. What do you mean by “Latest available release”? 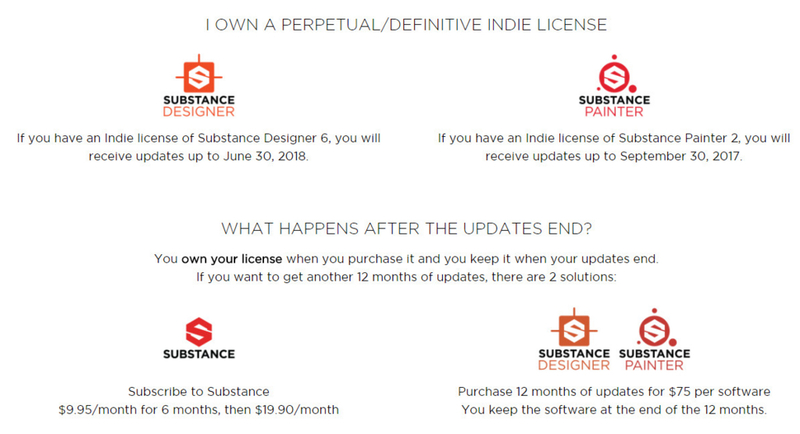 If you choose to leave Substance and own a license, you get the current release of the software. This license is yours to keep forever. It will include hotfixes but you will not receive new updates. What happens to the payments I’ve already made? The payments you have already made will be converted into months that can be applied to get the current release. If you’ve made 8 months of payment on Substance Live, these will count as 8 months of consecutive payments should you want to get the current release. Why do I now have to pay 12 consecutive months to own a license? Previously, no matter if you paused or not, you would only be entitled to the previous major release. You are now able to get the very latest release at the end of your subscription term and that’s why we ask in return for 12 consecutive payments. What happens if I pause my subscription before I have paid 12 consecutive months but come back later? You may pause / cancel your subscription at any time. However, if you want to own licenses and paused your subscription before paying 12 consecutive months, this period will start from scratch when you return. What If I just want to do some rental under the new system? This is still possible, as you can quit Substance whenever you want. You should pay $49 when you quit only if you want to own a license. This offer is available if you have been paying for 12 consecutive months. You don’t have to pay $49 if you don’t want to own a license. What If I just want to purchase a stand-alone license under the new system? Stand-alone and one-off licenses now include 12 months of free updates instead of upgrades to a specific major release. You always get a full year of updates no matter when you purchase your license, which is a fairer system.